I invite you to investigate for yourself whether it is really done? What did Jesus know? How could He be thinking about anything other than the pain that He’s currently dealing with? Why not think about the betrayal or abandonment He’s experienced? For some reason Jesus insists on remembering that He is on a mission and there are still prophetic passages in the Bible He has to listen to. Have you ever read a text that came to your mind in a rough time and you knew you had to obey? Tell us what it was on social media using the #MessageMag. The humanity of God in this moment is striking. Jesus the one who fed the five thousand with barely a basket of fish and chips, needed a drink. The same One who spoke to drink and made the composition of drink change dramatically, now needs drink. It is worth noting that it is ok to need in life. If Jesus needed from time to time, how much will we need? Take time to define what is a need for you. Then evaluate if you are ok asking for what you need and what stops you from doing so. It turns out that this cry for His thirst to be quenched was not just out of bodily necessity, but of divine mission. Jesus was so in-tune with His Father and the Word that He knew that there was something that needed to be handled. A distant whisper from a king long ago who held a special place in His heart. Have the old stories with old words in this old book we call the Bible ever whispered to you in hard times? Do you believe the Bible still matters in 2018? Let us know what you think on social media using #MessageMag. Before we dive into anything remotely deep, let me just pass on to you a thought worth pondering. Is it possible that the reason Jesus asked for drink wasn’t just because He was thirsty or wanted to fulfill the words of His friend David from years ago, but rather He had something important to say and wanted to clear his throat so he could say it clearly? Just a thought. The words that are spoken are an interesting choice. The writer, John, was himself at the cross. So, to read what he heard, and then see that other writers were only able to record that Jesus made a loud cry, makes the words even more compelling. Jesus said “It is Finished” and hung his head and died. If that’s all that happened, maybe we could say it wasn’t that significant. We find that there was a ripping of a veil that wasn’t even near the site of Jesus’ death, an earthquake, and the splitting of rocks. It is as if the very earth knew something had happened. What do you make of this? Let us know on social media using #MessageMag. This moment was the culmination of years of preparation, prophecy, and providence. Jesus, the Son of God was on a tree dying for the sins of the world and cries out “It is finished!” We must continually absorb the fact that what was finished, what was laid to rest, what was settled was the question: Is God really love? Could He, can He, truly love an un-loving people? Now the conversation was rendered mute, the disagreement became null and void. It was finished. Jesus’ cry wasn’t one of desperation, but rather of firm declaration. It is finished. Is it really done? Well, what that means for you is that you can be done wondering if your addiction has more power than God in your life. It is finished. The guilt of the bad decision you made all that time ago that still weighs you down? It is finished. The anger that fills your thoughts because of what that person did? It is finished. The stress that greets you in the morning before you even show up at your job? In Jesus, it is finished. All of this was handled once and for all on the cross for those that believe. So the question now is are you really done trying to do it yourself? You don’t have to know anything about the Bible, God, or Jesus to realize that something crazy is going on here. After reading that “Jesus knew that the Father had put all things under his power” (NIV), we see Him stoop to serve, like a slave. When you envision God, do you perceive Him as a slave? As a janitor? How does this imagery make you feel about God? 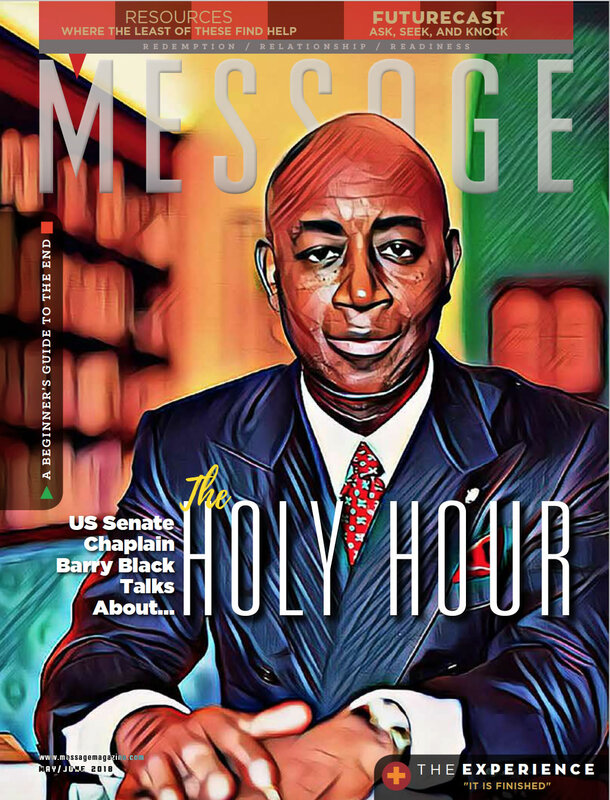 Let us know on social media using the #MessageMag. We’d love to hear your thoughts. .
Peter reacted in a way that many of us might: “Umm, God? You don’t have to do that.” Jesus knew and knows more than we can ever think. What is crazy is that Jesus didn’t mind getting on the floor and cleaning off the disciples’ feet—the feet of the humanity that He made eons before. What is humility? Tell us your personal definition on social media using #MessageMag. There had to be a level of discomfort in what the disciples were experiencing. Someone they had seen perform miracles is getting the dirt from between their toes. When challenged, Jesus says “Unless I wash you, you have no part with me.” It’s almost as if this uncomfortable situation is supposed to bring them comfort. Jesus is trying to help them experience peace. Has peace ever come to you out of distress? If you are willing to share, we are willing to listen. Share with the #MessageMag on social media and tell us your experience. Here Jesus speaks strongly about His personal brand of peace. This peace is one that is experienced when you allow Jesus to love and serve you. He lovingly sacrificed His life to give us a real option of salvation, and He wants, yes, He desires that we serve others in His name. His expectations of us come after He offers us His peace. Does this makes sense to you? If so, share something with us about the peace He has given you. If it does not make sense, we would love to help you understand His offer and how to get it. 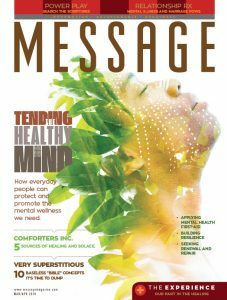 Reach out to us using #MessageMag. Jesus breaks bread and shares drink with the disciples after washing their feet. Nothing is His own. He has given His time, His service, and His effort. He doesn’t stop there. He concludes with giving a representation of His body and His blood. What more can Jesus give? Well, He would eventually give His life. Since Jesus has given everything, what should we hold back from giving? What do you have that is hard to sacrifice? 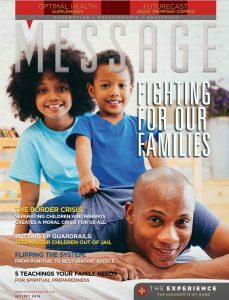 Tell us using the #MessageMag. While Jesus is serving, giving peace, and displaying love, there is someone at the table who has decided to betray Him. If that’s not bad enough, the next conversation the disciples decide to have focuses on which among them would be the greatest in the Kingdom of Heaven. Yet, Jesus knowing all that was in their hearts decided to not only eat with them, but wash their feet. Could you do it? Could you sit at the table and show exceptional hospitality to people who are going to betray you and undermine your mission? What about take your life? Jesus ruins what everyone believed to be greatness. He shoots down the idea of yearning to build a reputation for yourself. He destroys the pursuit of promotion by pulling others down. He says, in essence, if you want to be high in the Kingdom of Heaven, find out in your actions how low you can go. I remember when I was in Kindergarten, in the principal’s office there was a box. In this box was a collection of some of the most random objects you could imagine. Everyone in the school knew about this box and what its purpose was. It was the lost and found box. It was the place where hope was realized and disappointment turned to joy. Things that were misplaced or forgotten were often reunited with their owner. It seemed like the more valuable the item that was in the box, the more the owner appreciated having it back. Join us as we explore what it was like to lose and find that which is most valuable. Imagine you’ve been waiting for something your whole life. You’ve consistently lived in such a way that showed you were waiting for something to happen that would alter history. Then imagine what you’ve been waiting for shows up and you have no idea. Jesus the One the Jews had been waiting for shows up as a 12-year-old boy and no one knows! Is it possible that He has given us exactly what we most deeply desire and we don’t realize it? Are you willing to give God a chance to do it? Share it with us here using #MessageMag. How crazy is it to think that a child who was born of immaculate conception, had shepherds worship Him at birth, and Magi brought Him gifts as a toddler, is allowed out of his parents’ sight for around 24 hours? Imagine the panic that overcame Mary and Joseph. Have you ever lost something valuable? How did you deal with it? 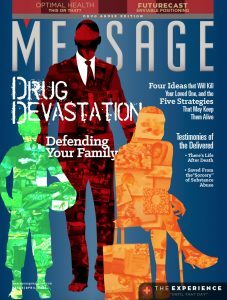 Share your experience with us using #MessageMag on Social media. They lost Jesus for about three days! If we take the words of the text for what they are it suggests that they were so sure that Jesus was close that they ruled out that He could have been left behind. What a sobering challenge to having relationship with the Lord. I invite you the pray with us as we dismiss the temptation to assume Jesus is always with us. We would love to read your prayers on social media. 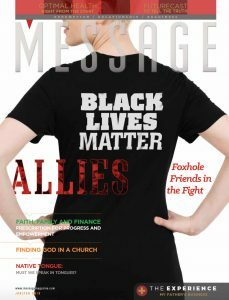 If you share, use #MessageMag. Sometimes we’re tempted to think our best days are behind us. If you think this is true for you, why not go back and get them? Impossible, you say? Nothing is impossible for and with God. Mary and Joseph had to go back to where they came from to get the greatness they left behind. Maybe we have to resolve to do the same from time to time. Is there anything in your past you desire God to give you strength to get back? We want to pray for those things with you. Give us your prayer request on Social Media using #MessageMag. No matter your spiritual preference, trust is an indispensable ingredient in growth. Here a young Jesus is found doing what He would be doing the rest of His life. Do we trust that how things go are the way they are meant to go? What does it mean to trust? Tell us on Social media using #MessageMag. It wasn’t only Jesus who was lost in this story, but His parents also. They didn’t understand that Jesus couldn’t be lost because He was the one throughout human history who searched out those without direction. While we search for Jesus He’s always where He needs to be. Has He ever been in an unexpected place for you at just the right time? Tell us about it using #MessageMag. Jesus was lost and then found. He has forever specialized in seeking the lost and redeeming the found. I pray that you never leave Him behind but if you do, remember when He found you in the box with all the other trinkets and was overjoyed for you to be back with whom you belong. How much happens in a day? How much happened in your life over the last year? How much have you experienced in your life? What if I told you that there is not one detail about which God is not unaware? He is able to have everyone in the whole world in His hands, and still focus on the specifics of your life. Join me in this experience that shows us how focused a Lord and Savior we have. Jesus is popular. He has done things people had never seen and it caused them to want to go wherever He went. You would think that this would be a completely positive thing, and it mostly is, but what if Jesus was looking for some time alone? Have you ever seen in your life that responsibility is a byproduct of blessing? 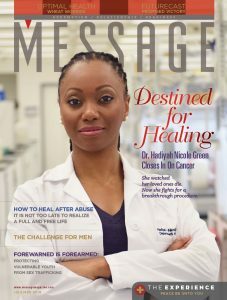 Tell us about a time that you received favor but also took on duty using the #MessageMag on social media. It’s easy to be hard on Philip. All he was doing was what many of us do on a regular basis. He was focusing on the tangible. He was crunching the numbers and counting the cost. The only thing was that Jesus “already had in mind what He was going to do.” Has this ever been the case for you? You thought you knew best, but God had other plans? 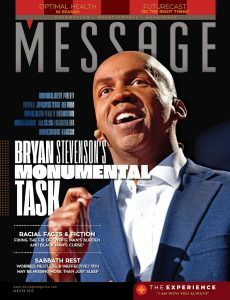 Tell us about it here at Message using the #MessageMag on social media. Take some time today to slow down and meditate on the words of this refrain and allow God to show you times in your life where He has shown them to be true. I personally appreciate the details given here by John. He says that after Jesus had His disciples sit down, “he took the loaves, gave thanks, and distributed…” Isn’t it curious that He gave thanks before the multiplication of the food? Jesus gave appreciation before the manifestation of what was hoped for. How challenging is it to truly be thankful before you get what you desire? Take some time to consider James 1:2; Philippians 4:4, and Philippians 4:19, and tell us why Jesus would give thanks at the time He did. Share it with us on social media using #MessageMag. There are a lot of things for which we can be thankful. More than I can list, and more than would come to someone’s mind. If you are reading these words, more than likely you are in a situation where you have been shown favor to have some level of comfort. It may not be what you want, but at least you have something. There are people in this world who don’t have a roof over their head, and barely any food to eat; yet, God has allowed others to have more than enough. Take time to pray about having God open your eyes to see what you do have and how you can help others, rather than what you don’t have. The people were so in awe of what they saw and had experienced that they began to plot the next move without consulting Jesus. After literally tasting and seeing how good the Lord had been, they wanted to put Him in the place they thought He should be. There was only one problem; Jesus was nowhere to be found. It may seem like a crude question, but has it ever seemed like God has walked out on you when you were expecting Him to be there? 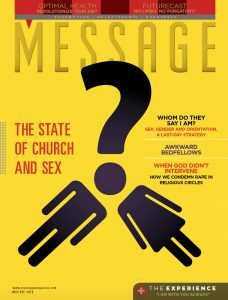 Tell us about it here at Message using the #MessageMag. The Bible tells us that the reason Jesus was missing was because He knew that they were going to attempt to make Him king. Wasn’t He supposed to be king? Wasn’t He already King? I want to encourage you in times when it seems like God isn’t doing what you want Him to do, just know He is simply on a different schedule. It doesn’t mean He’s not loving, compassionate, or able. It could be that He is tending to something that will maximize the moment when everything comes together. It wasn’t time for Him to be crowned King because He wasn’t done yet.